These are pictures of a Sierra hike that began at Lake Edison, wandered through Graveyard Meadows, over Silver Pass, down to the Lake of the Lone Indian, and back over Silver Pass. It’s mostly for the benefit of the survivors of he expedition, but I include some notes at the end for those who may be looking for information while planning a similar trip. 1. Silver Fox Pass is the unofficial name of the cross-country route between the Graveyard Lakes and the Peter Pande basin. It is class 1 from the Graveyard Lakes side, with a use trail most of the way. The Peter Pande side is class 2, with a lot of clambering over rocks. Although we did not do it, I talked with several backpackers who did. They had no particular difficulties, though I would not recommend the route if you haven’t had some experience carrying a pack cross-country. 2. The best campsite at Lake of the Lone Indian is on west side of the lake, a bit past the junction with the trail that heads toward Peter Pande Lake. There is another good site about 75 vertical feet above this site, which could handle one tent easily, and two if necessary. There is also a site on the east side of the lake, near the outlet. 3. We stayed the night before at the Vermillion Valley Resort, which I highly recommend. We did, however, arrive later than I had planned (10:00 p.m.), and I had inconsiderately neglected to call them. They did get us settled, but had to wake someone to get the key. The shop also happened to be out of the stove fuel we needed, which caused some inconvenience. So if you will be arriving late, do let them know. 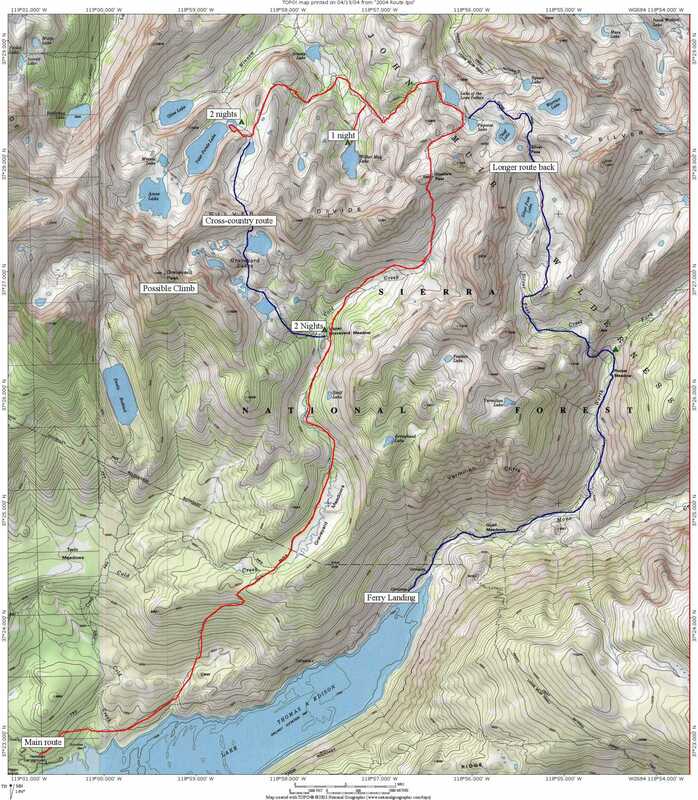 After mixed feedback from potential expedition members, I’m planning on the Silver Divide from 8-16 August. Here’s the report that persuaded me: The Silver Divide. Snowfall this year so far is below average. For this one, we return to the starting point of the 2001 trip, Lake Thomas Edison. We’ll head north instead of South. I’ve not been in any of this territory before. Here’s an orientation map. Lake Thomas Edison is to the south. And here is a more detailed map of the entire area.This map has a variety landmarks noted and possible routes, but we may not follow it too precisely. August 8: Fly from Grand Rapids to San Jose, drive the lovely Kaiser Pass Road to Lake Thomas Edison. We’re booked at the Vermilion Valley Resort. August 9: Lake Thomas Edison (about 7600′) to Upper Graveyard Meadow (9600′). A packer will take the packs up to the campsite, about 8 miles. August 10: Layover day. Explore Graveyard Lakes. Graveyard Peak (11,494′) is a possible climb. August 11: Over Goodale Pass (10,997′) and down to Wilbur May Lake. August 13: Layover day at Peter Pande Lake. August 14: Hike over Goodale Pass to Upper Graveyard Meadow. Alternatively, we could go over Silver Pass. The more intrepid among us might want to take a “short cut”. Peter Pande Lake is just over a ridge from Graveyard Lakes, and I have an email from a chap assuring me that it is doable, though there is some talus. It’s about 8 miles by trial, two miles cross country. I’m tempted, but we’ll see how things look on the scene. August 15: Hike back to the trailhead. (If we go over Silver Pass, we’ll use the ferry, departing at 4:45 p.m.), drive to San Jose. We have reservations at the Homewood Suites. August 16: Fly from San Joseto Grand Rapids. As always, what we actually do will likely be a bit different. A recent hike report, covering much of this ground. Check the 2003 folder. A 2002 report, including the view from Graveyard Peak. And another report from some folk who changed their plans.